When you know a brand for a while it doesn’t make it easier to review its new launches, in part because if their products were good before, you already set your expectations high and sometimes they fall short. With Caudalie the bar is permanently set high but this French brand manages to deliver both visually, as well as results-wise. Last month Caudalie launched its new perfume called Rose De Vigne. If you ever visit Les Sources de Caudalie in Bordeaux and walk around their vineyards look at the beginning of each grapevine and you will see a rose-bush. Why? Well, roses are fragile plants that are susceptible to ‘issues’, so by planting them in each grapevine proprietors have their environmental guards that quickly show signs of a possible imbalance or threat to the vine. In return, the vines help irrigate roses, so they bloom with silky petals, which can be collected and used for a variety of purposes, like infusing your bath water with them. The new sparkling signature scent captures the aroma of the vineyard roses in early morning, when the nature and you are just waking up to start a new day. Mathilde Thomas, who founded Caudalie together with her husband, used to dab in perfumery and to this day retains an affinity for this magical craft, so I would imagine this perfume must be particularly close to her heart and her nose. The beautiful rose is expertly blended with notes of grapevine branches and stalks, as well as with the heady notes of zesty grapefruit, spring rhubarb and heart notes of blackcurrant and roses from Grasse. Add to that base notes of magnolia, musk and amber woods and you get the overall scent that celebrates feminine grace and romance. Each bottle of perfume is bound to find its customer, appealing to the memory of a happy event of the past, evoking the sense of contentment and sensuality. The perfume has also been ‘photo-sensitivity tested’, so when you spray it on your skin in the morning, it won’t lead to ‘light’ patches on your skin after exposure to the sun rays. 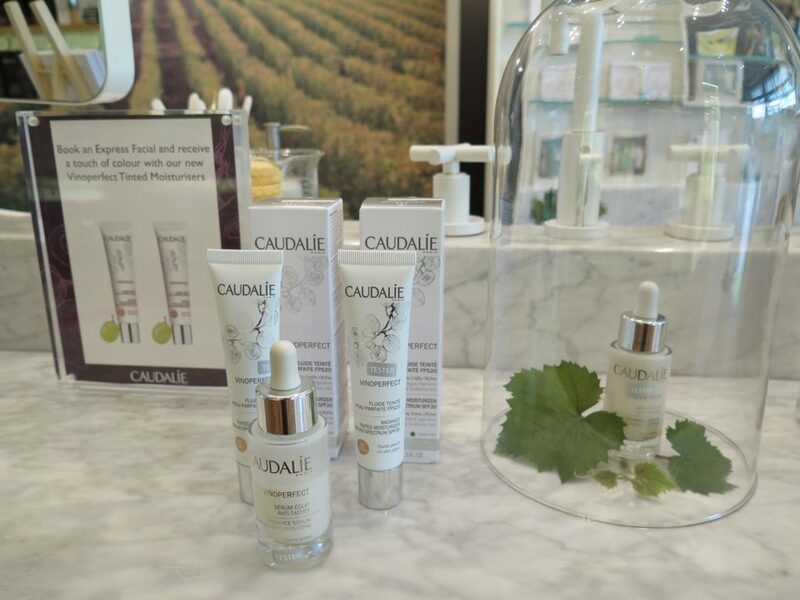 From perfume to a latest launch in Caudalie’s Vinoperfect range ( in France this range has a 30% share of the anti-pigmentation skincare market, it is that popular due to its efficacy ) – the Radiance Tinted Moisturizer with broad spectrum SPF 20. It comes in two shades ( light and medium ), is suitable for all skin types and will give your skin a matt finish. When it comes to tinted moisturisers not many come close to wrestling two of firm favourites from Burberry and Kiehl’s from the mantlepiece but Caudalie created an impressively light-weight formula that ticks all the boxes – covers imperfections, evens our skin tone, is oil-free, has hyaluronic acid that plumps the skin up and contains an extract of Viniferine 500. Simply put, it will give you the best version of your skin almost instantly ( provided you look after your skin in the first place ! ). According to Mathilde Thomas ” in vineyards of the past, women used grapevine sap, rich in Viniferine, to create a radiant complexion and reduce dark spots’. Viniferine is a pure and natural active ingredient derived from grapevine sap and is one of the most effective natural molecules that helps fight the problem of dark spots and pigmentation, as it assists in homogenising melanin production. It is also known to help prevent new age spots from appearing by protecting tyrosinase from oxidative stress. It also encourages cutaneous micro-circulation and according to Caudalie’s tests on 22 people, Viniferine is more effective than topical application of Vitamin C.
After cleansing your face in the morning, apply your usual serum or moisturiser ( if you want double efficacy, start with Caudalie’s Vinoperfect Radiance Serum ) and then apply a small dot of this tinted moisturiser to the tips of your fingers and spread it upwards all over your face and neckline, extending and blending towards the hairline and the ears. You can also apply it with the foundation brush, my latest helper comes from RMS Beauty, called Skin2Skin Foundation brush ( it has a unique dual technology approach, where varying length bristles are layered in a swirl pattern, thicker at the bottom and thinner at the top, so the brush curves easily all over your face, giving a perfect finish ). A little note though: please avoid the eye contour area, this product wasn’t developed to be used as under-eye concealer. A little beauty tip that team Caudalie shared: if you start using shade 1 and then go and get a sun-tan, switch to shade 2. As you tan gradually starts to fade, mix the two shades for a perfect match ( I have tested it & it works beautifully, just play with the amount of both shades before mixing and applying it to match your skin tone perfectly ). Ultimately this tinted moisturiser is perfect for those of you who like to enhance your beauty naturally, blending the imperfections away and protecting your skin from the harsh sun rays. It will glide on easily, without blocking the pores and help you feel like the best version of yourself every day, thanks to a beautiful French skincare brand that knows the secrets of skincare and is happy to share them with you.